The Istituto Storico San Josemaría Escrivá has just published volume 12 (2018) of the journal Studia et Documenta. As usual, the publication is made up of five parts: a monographic study, a section on studies and notes, a section dedicated to the publication of documents, a section on current news and a section on bibliography (index). The monographic theme which is the subject of the first part of the volume focuses on the study of some of the “traveling companions” of the founder of Opus Dei. 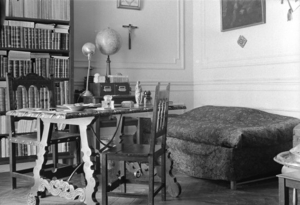 In particular, his confessors and the books that were part of his personal library. By exploring the personalities of those who were his spiritual advisers and examining the writings that contributed both to his intellectual formation and to his foundational task, it is possible to get a better appreciation of St. Josemaría Escrivá’s place in the history of spirituality and, more broadly, in the history of the Church. The monograph consists of two articles. In the first part, Constantine Anchel carries out an in-depth study of the priests who accompanied St. Josemaría Escrivá spiritually from his early years until June 1944, when Blessed Alvaro del Portillo was ordained priest and became his confessor and spiritual director for the rest of his life. The author identifies more than thirty priests, he then establishes the circumstances, duration, and even the particular characteristics of the relationship established in spiritual direction by each of them with the founder of Opus Dei. These were priests who stood out for their life of piety, for their theological formation and for their pastoral experience and zeal. St. Josemaría’s room in the residence on Jenner Street. The second part of the monograph, by Jesús Gil Sáenz, analyzes the almost two thousand five hundred volumes that made up the library of St. Josemaría Escrivá. The author offers an enthralling story, in the style of a detective novel, that allows us to reconstruct the genesis of the library, which began to develop in 1937. These are books that the Founder gathered together with the intention of consulting them and which he used for his study, his personal work and his spiritual reading. The Studi e Note section consists of five articles on various topics. In the first, Inmaculada Alva analyses the apostolate carried out with women from the latter years of the Spanish Civil War up until 1942, based on the letters, diaries and testimonies of the protagonists. In the second article, Onésimo Díaz considers the Jenner University Residence, promoted by St. Josemaría Escrivá in Madrid in post-war Spain, paying special attention to its functioning and to the human and Christian formation given to its residents. All of this is done while taking into account the historical context of the development of Opus Dei after the Spanish Civil War. 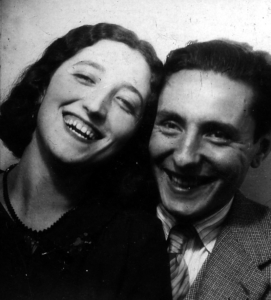 Tomás Alvira, one of the participants in the first supernumerary gathering held in 1948 in Molinoviejo, with his future wife Francisca Domínguez. In the third article, Luis Cano analyses the first gathering of supernumeraries which took place in 1948 in Molinoviejo (Segovia). Fifteen people participated, and St. Josemaría explained many details about the life of supernumeraries to them, aspects that have been reconstructed thanks to the notes and testimonies of some of those present. In the fourth article, Francisca Colomer introduces us to Ramona Sanjurjo, a supernumerary of Opus Dei since 1948 who, from her native Vigo, participated in the development of the apostolic works of Opus Dei in Galicia and Portugal. Her lifestyle and apostolic activity were analyzed by means of the letters she wrote from the time she met Opus Dei until the establishment of the first center of the Work in Vigo. Finally, in the fifth article, Federico M. Requena analyses the figure of Fr. William Porras, who was chaplain of Harvard University between 1954 and 1960. The study explores the reasons why the Archbishop of Boston chose the first Opus Dei priest to arrive in Boston as chaplain. He then goes on to analyze the activities he promoted, and his vision of how Catholics should live and make their Catholicism present in an institution like Harvard on the eve of the Second Vatican Council. 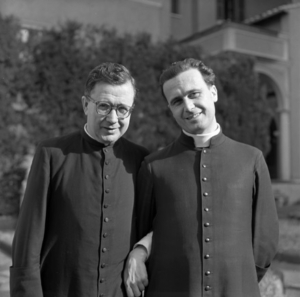 In the Documenti section, Alfredo Méndiz examines the correspondence between Salvador Canals and St. Josemaría Escrivá in his first year as a priest (1948-1949). The Notiziario section gives a brief overview of the origins and development of the Josemaría Escrivá de Balaguer and Opus Dei Virtual Library, a virtual platform created and developed by the Center of Documentation and Studies on Josemaría Escrivá (CEDEJ), which is responsible for disseminating work of an academic nature about Opus Dei, its founder and successors, its members and the apostolic initiatives they have promoted over time. This section concludes with the text of the lecture given by Prof. Antonio Aranda at the Pontifical University of the Holy Cross on the occasion of the feast of St. Thomas Aquinas, patron saint of the Faculty of Theology, entitled: A cinquanta anni da “Amare il mondo appassionatamente”. The Sezione Bibliografica completes the volume. A review and bibliographical record are presented of fourteen recent publications, as well as an extensive list of works published between 2010 and 2013 about Opus Dei and various apostolic initiatives. To see the index click here.